Regardless of who you are, if you ever wronged my father in some way, I don't know about it. I've already mentioned this characteristic about him in my tribute from his funeral service, but it's so remarkable that I think it's worth telling again in a fuller way. One of the things that I came to admire most about him was that he literally never spoke negatively of other people (with the only possible exception being some of his comments about politicians he disagreed with). "Fuddy duddy" was about the most negative descriptor of a person that I ever heard come out of his mouth, and he never elaborated with anything else negative, so I'm still not sure what exactly Fuddy duddy means. For longer than I've been alive, the hat rack pictured above has hung in my parents' house. My Mom found the piece in the center, and my Dad's mother, who was a very good woodworker, added the mirrors and other pieces to turn it into a hat rack. 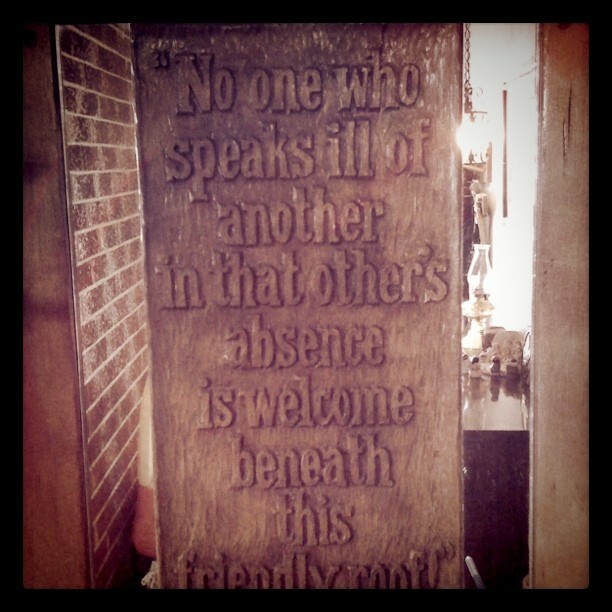 Think of how often we would have to hold our tongues (and often find it really hard to do so) if we were to live out its inscription: "No one who speaks ill of another in that other's absence is welcome beneath this friendly roof!" Yet my Dad lived out the inscription and went a couple of steps further; it didn't matter if the person was absent or not, nor under what roof we found ourselves, he apparently never saw the value in speaking negatively of other people. 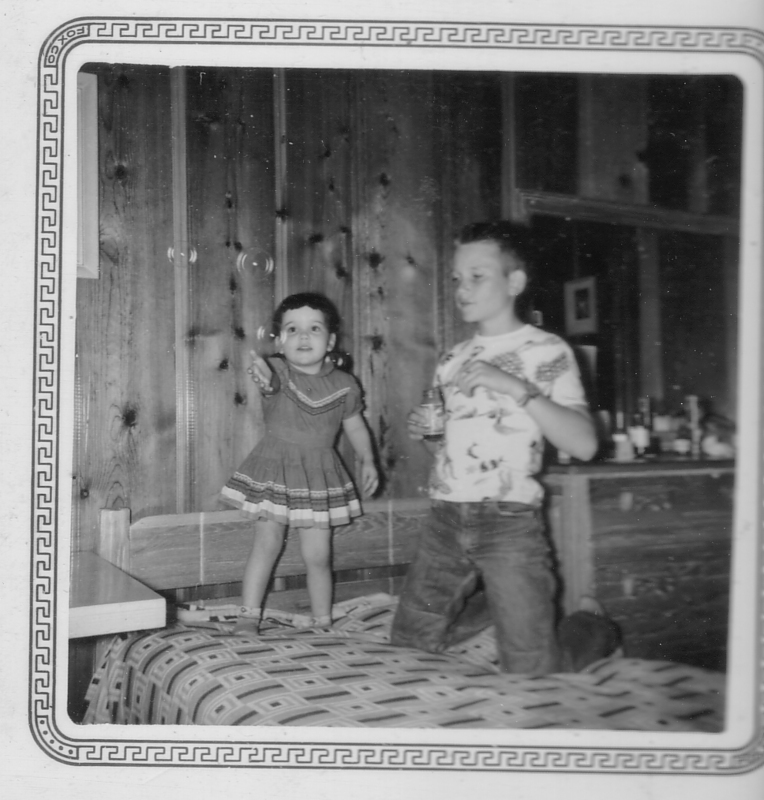 In the days following his death, his youngest sister attested to this as she shared pictures of the two of them together as children (including the one below) and said, "I do not remember one angry, even irritated, word from him towards me, ever, which considering he was seven years older and I was undoubtedly a pest, is amazing." Perhaps it was easier for my Dad than most people to avoid all negative talk toward or about others, because, well... he didn't say much of anything. But, I've also known quiet people whose only words were complaints, while my Dad had no problem telling about good things that others had done. Remembering this about him has made me reflect on a couple of things: First, I'm very thankful for it, because he left me able to see the good in my relationships with people, even if they were people with whom he may have had some negative experience in the past. Like any good father, he had his ways of influencing who I spent time with and who I didn't, but he never felt the need to bad-mouth someone in order to accomplish that. So, if you were someone who had a difficulty with him at some point, and I now have a good relationship with you, we both owe him thanks. I likely would have had my self-defenses up against you if he had ever felt the need to criticize you. And that leads to the next thought: Why do we criticize people, and how often is it really necessary, beneficial... or even, how often does it not do harm? The first reasoning that comes to mind is that we feel like we need to tell others what someone did in order to protect them from experiencing the same harm. This seems honorable at first, but I don't think that's actually our purpose as often as we might let ourselves believe. Sure, we might be able to think of some drastic cases where that might apply: "Son, that man with the chainsaw is Bob. The last time Bob came over with a chainsaw he cut off my arm. He has terrible aim. Don't be friends with Bob." In cases like that (or cases less ridiculous, where some serious harm might be at stake), it would probably be the right thing to do to speak some negative words about Bob. It would seriously cut down on our ability to harbor anger toward others. If someone has treated us badly and we tell others, we turn something that should stir compassion in us into a sore that we just allow to fester, and then all sorts of damage become possible. As Dallas Willard has said, "to cut the root of anger is to wither the tree of human evil." It would increase our ability to give a much-needed gift to others by letting them have a clean slate in a relationship. I remember once as a kid, like a moron I decided to join in with some other boys of making fun of a girl in our class one day. She couldn't hear us, but another boy near me said, "Hey, that's my sister." In later years, I came to be very good friends with the whole family. Thankfully he didn't relay my careless words and allowed me to have a clean slate in beginning new friendships with his family. I'm sure you can think of other ways this would help us to harm others less and leave more room for good to be done. But I can also think of one major problem: even if this habit of my Dad's sounds good to all of us, our mouths can be remarkably capable of letting things out before they pass through any filters we would like to have in place. So what's the answer? Practice. Even in small things I can practice stirring compassion rather than harboring resentment: "Yes, it stinks that Bob just ate my piece of dessert, but he must be really hungry after using that chainsaw all day." I can also practice re-telling the good that people do: "You should really see how much better Bob's aim is getting. Just keep a good distance." As we practice with the things that seemingly don't matter much, we'll find that it becomes easier to act like we intend to with the things that really do matter. Because my Dad had practiced this from the time he was a little boy, by the time I came along, it would have actually been difficult for him to come home and gripe about something someone did. Not passing it on was really easy. So let's give it a shot: depending on how often each of us normally engage in of bad-mouthing (whether it's something you can remember doing once several years ago, or perhaps you consider it a hobby), let's set ourselves appropriate and attainable time limits to practice not doing so (maybe a 2 days, or a week, or 30 seconds), and see what happens. Maybe repeating this to yourself will help: Don't be a Fuddy duddy.